Breakfast at your hotel (possibly Miss Molly’s Inn Bed & Breakfast) or in one of the many restaurants serving hot, full meals to get you started. Spend some time on Historic Main Street to learn about the history of Misty of Chincoteague with a visit to Miss Molly’s Inn Bed & Breakfast where Marguerite Henry wrote the world famous children’s book in 1947 and Island Theatre to view Misty’s hoofprints which were cast in concrete at the movie premier of Misty in 1961. Look across the street at Robert N. Reed Downtown Waterfront Park to see the beautiful Misty statue, which was originally located across the street from Beebe Ranch. View your guided tour of “All Things Misty”. Take a step back in time with a visit to the Museum of Chincoteague Island. 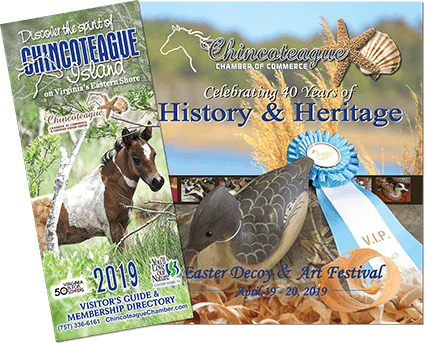 View the Beebe Ranch exhibit, including Misty and Stormy, and learn more about the island’s rich history and traditions through various exhibits showcasing decoy carving, oyster industry, farming, and more. Hike, bike, or drive the Chincoteague National Wildlife Refuge to see the Chincoteague Ponies grazing on the lush, green marsh grass or walking on one of the nature trails. Bicycles are available at one of several bike rental companies. Visit the Chincoteague Pony Centre to see descendants of the Misty family and veterans of the Pony Swim. Take a riding lesson or pony ride, enjoy a pony show, and see the Memories of Misty Museum. Hop aboard a boat cruise or paddle on a guided kayak trip to see the Chincoteague Ponies on Assateague Island with one of our knowledgeable boat captains and guides. Shop for horse-themed and other treasures while you stroll through the shops and boutiqueson the island. Be sure to purchase a copy of Hidden Galleon: The True Story of a Lost Spanish Ship and the Legendary Wild Horses of Assateague Island to learn more about the legendary Spanish shipwreck and how the ancestors of today’s Chincoteague Ponies arrived on Assateague Island. Complete your day with an ice cream sundae at one of our ice cream parlors, complete with pony themed flavors and sundaes. Plan your visit around the annual Pony Swim and Auction; an island tradition dating back to 1925. The Pony Swim and Auction are held on the last Wednesday and Thursday in July, with festivities happening all week long. A magnet for horse-lovers, come witness a wild herd of ponies rounded up, swum across a narrow channel, herded through the quaint narrow streets of an island town, and auctioned to the highest bidder. The annual Chincoteague Volunteer Fire Company Carnival can also be enjoyed with great food, fun, music, games, and more for the entire family.